The cultured adult's "Disney World". You will meet some people what say that they just didn't like Venice. During a visit in 2010, nobody in our party of four could even imagine what those people have in mind. We had an absolutely wonderful visit. Some of those opinions, I suspect, are based on old memories. The city is very tidy these days, and the days of garbage in the canals are long past. The city does continue to face engineering challenges, but there is no sense, as there was 40 years ago, of a great city, crumbling before your eyes. 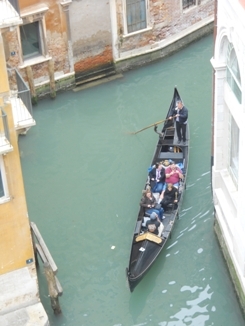 Visit Venice, and you will be rewarded with one of the most memorable experiences of your life. You can reach the Venice airport from the US by connecting through an international hub, such as Frankfort or Brussels. The other alternative is the water bus. This is public transportation and will make a lot of stops. You will save money that way, but don't forget that you will need to carry your luggage from the stop to your hotel. One of my most enduring memories of Venice is middle-aged visitors schlepping their luggage down streets and over bridges. Please be prepared for a city that is expensive. You will walk everywhere and go up and down bridges all day. If you are not physically prepared for that, then you shouldn't go there. Antica Trattoria Poste Vecie, near the Rialto, was a favorite. 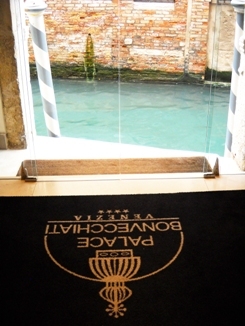 We had an excellent experience at our hotel in 2010, the Palace Bonvecchiati in Calle dei Fabbri. This is in the San Marco area, but it also is not far from the Rialto area. The hotel was recently renovated and is fully non-smoking with modern amenities such as a fitness center. It is disability friendly. The rooms were large by European standards. Water taxi entrance at hotel.